After 3 months of complete renovation, this emblematic Times Square hotel has been turned into respite for contemporary travelers. Thanks to its original Supernova restaurant experience, the stunning terrace and striking state-of-the-art design touches, this property reflects how innovation is at the heart of Accor’s midscale founder brand and how it strengthens its development. More metamorphosis than mere makeover, this property is the first hotel in Times Square to undergo a large-scale redesign. Its striking room upgrades, the new restaurant, Supernova, and the exclusive outdoor Terrace offer unparalleled views of Times Square. The hotel aims to emerge as a go-to destination for both travelers and locals who long to be where the action is, thanks to its electric atmosphere. 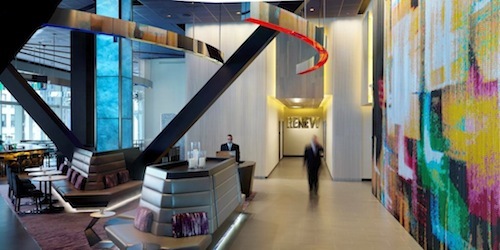 With its sophisticated styling, the newly-redesigned 4-Star Novotel New York Times Square invites you to experience the electricity of Times Square. Located in the heart of Manhattan, right in the Theatre district, this unique Midtown luxury hotel is within walking distance to New York’s best attractions, including Times Square, Central Park, and the prestigious 5th Avenue. 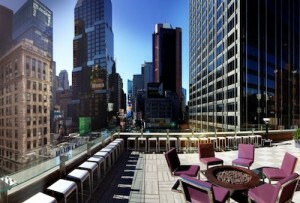 You’ll be captivated by stunning panoramic views of Times Square at the trendy new restaurant Supernova.